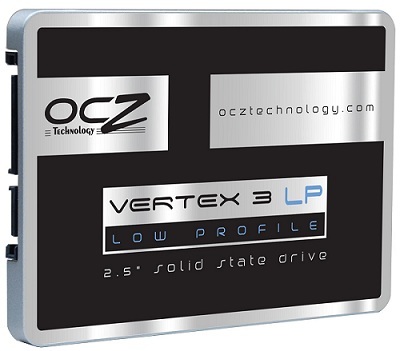 OCZ has added a low profile version of its Vertex 3 SSD to its product list. What does the novelty bring to the end users? Smaller dimensions for one thing with the new drive coming with a height of 7 mm, which is 2.5 mm slimmer than most 2.5-inch drives. Other specs largely coincide with the regular Vertex 3 SSD with the low-profile version fully supporting SATA 3.0 and coming with 20-ish nm MLC flash memory chips. Available in 60 GB, 120 GB, 240 GB and 480 GB capacities the new slimmer OCZ Vertex 3 SSD is capable of writing data between 450 MB/sec and 520 MB/sec depending on model and reading data between 530 MB/sec and 550 MB/sec also depending on model. Wide market availability is expected in a few weeks but pricing is unknown.